Greg Page, the executive chairman of Cargill Inc., will speak at Kansas State University on Oct. 12 about the economic impact of climate change on the world's food production. Page, a Cargill employee since 1974, will present "Climate Change and the Future of Food Production" at 7 p.m. in McCain Auditorium as part of the university's Henry C. Gardiner Global Food Systems Lecture Series. Admission is free and open to the public. In addition to his work at Cargill, Page is a member of the Risky Business project, which was formed in mid-2014 to prepare American companies for climate change. Page serves on the project's risk committee, which includes five former White House cabinet members, two former mayors, two billionaires and several distinguished businessmen. As a member of the project's risk committee, Page has urged members of Congress and U.S. farmers to take climate change seriously. He encourages American business and government leaders to have serious conversations about accommodating climate change scenarios in the future. John Floros, dean of the College of Agriculture and director of K-State Research and Extension, said the university has a long, valued relationship with Cargill, one of the world's largest food companies. "In 2015-16, we are celebrating 20 years of the Cargill/K-State Higher Education Initiative," Floros said. "Cargill has partnered with Kansas State University to provide guidance and assistance to the university's diversity programs, leadership studies, the colleges of Agriculture, Business Administration and Engineering, plus other areas across the academy. "We are proud to be one of Cargill's core universities." Cargill, celebrating its 150th year, provides food, agriculture, financial, and industrial products and services around the world. The company has 153,000 employees in 67 countries. 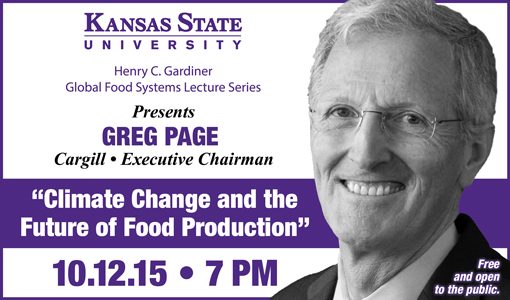 Page's lecture at Kansas State University is the second in the Henry C. Gardiner Global Food Systems Lecture Series. Robert Fraley, the chief technology officer for the Monsanto Co., presented the inaugural lecture in January. The mission of the lecture series is to provide science-based education about the global food system. The series allows university students, faculty, staff and Kansas citizens to interact with U.S. and international food industry leaders. For more information on Page's appearance at Kansas State University, or to watch his talk live on Oct. 12, visit here.